Rhizomatous perennial with dark red upright stems rising from a stout rootstock and bear alternate, stalkless, ovate, toothed, dark green leaves up to 8cm long. 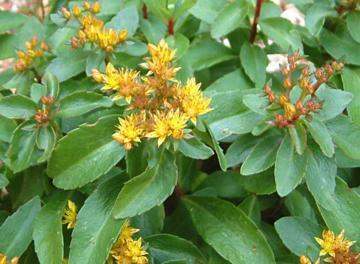 Clusters of star-shaped orange-yellow flowers opening from red tinted buds in summer, followed by round to ovoid red fruits. Prefers moist, well drained soil in full sun. Drought tolerant once established and will grow in poor soil. Alpine and rock gardens, dry sunny banks and wall crevices. Native to Eastern Asia from Siberia to Japan.